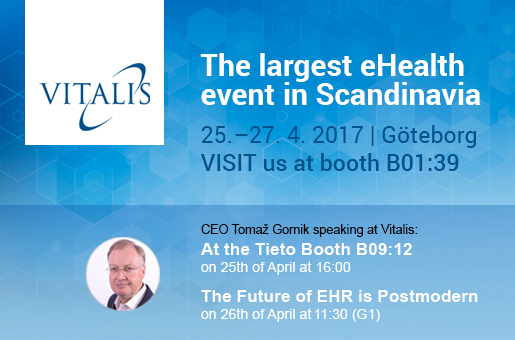 Better by Marand will be showcasing its Better Platform™ at the largest eHealth event in Scandinavia, Vitalis, which is taking place from 25-27 April 2017 in Gothenburg, Sweden. Vitalis combines a three-day conference program with an exhibition that covers every aspect of business development in health, care and welfare where IT solutions provide support and assistance. On the second day of the conference, 26 April, Tomaz Gornik will be speaking about the postmodern EHR. Marand shares the view that the future of EHR is postmodern, promoting solutions that best deliver semantic interoperability while minimising the risk of vendor lock-in. A postmodern EHR is a multi-vendor environment built on an open and agile architecture, where introducing, renewing and replacing applications, devices, and cloud services is easier and faster compared to legacy monolithic EHRs. A cornerstone of any postmodern EHR architecture is a health data platform capable of managing data on behalf of all constituents of the architecture. We will be showcasing Better Platform™ that supports the vendor-neutral data concept at the exhibition booth B01:39. Marand’s experts will be available to discuss their latest implementation projects and experience, validating the vendor-neutral data concept that is applicable either as a core electronic health record or as a solution to the feral systems dilemma.